I thought I would share a photo of the replacement hanging basket which is outside the house, after the previous one went missing (see post here). It does look a little pathetic at the moment, as the plants need to grow on a bit, but I hope that it will provide a splash of colour. It has a verbena at the back, an ivy leaved pelargonium, a pink calibrachoa and two white petunias in it. The choice of plants was a bit limited due to the bedding plant season being nearly over. 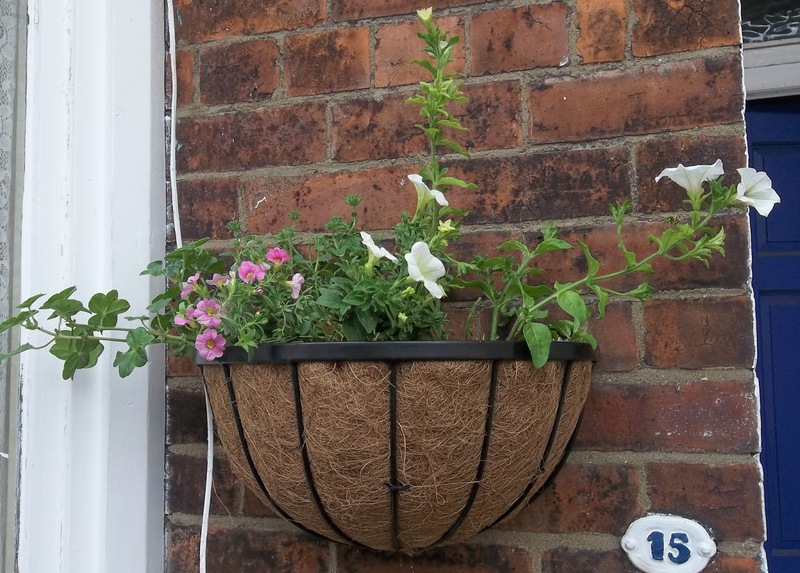 The basket is screwed to the wall with brackets, and the liner is attached to the basket with cable ties, so I hope this one will be with me for a good few years. A small act of defiance can be a very positive thing. If only all acts of defiance were so positive, colourful and beautiful. Love it, and hope it thrives. Thanks, EC. I hope it does well too - it has got a couple of months (hopefully) to fill out and grow before the weather starts to cool off. I shall enjoy watching it grow. Thanks, Amy. 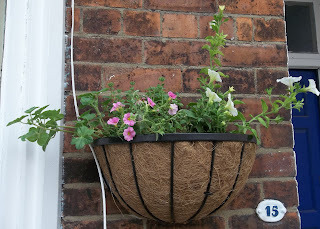 Well, I couldn't let them win and stop me from putting plants at the front of the house, now could I? Quite right, Illegitimi non carborundum!